Our 3 bedroom apartments come standard with overhead lighting throughout. 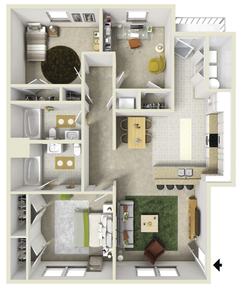 Our open, eat in kitchens include a breakfast bar, built in microwave, dishwasher, and ice maker in the freezer. Featuring side by side windows and a ceiling fan, the large living area is the perfect size for entertaining all your guests. The laundry room/closets are just off the kitchen and are equipped with washer/dryer hookups. Our master bedroom features a ceiling fan and 2 large closets with built in shelving which allows for plenty of closet space. Both guest bedrooms have large, walk in closets with shelving built in. With a spacious guest bathroom that is big enough to share, why look any further?